With the newest version of the International Energy Conservation Code (IECC) on its way, we want to make sure all jurisdictions in the Southwest reap the benefits of the most recent energy codes and aren’t left in the dust with poorer-quality and leaky buildings built according to prior codes. We recommend moving to the 2015 IECC and improving efficiency beyond this baseline in the future. Staying on an earlier energy code is like keeping your computer on, say, Windows XP or Windows Vista. It’s no longer supported, it’s buggy in places, it doesn’t work with other programs, and you’re left behind while the rest of the country has updated. It may appear cheaper upfront, but ends up costing far more over the long run. (If you’re on the 2006 or 2009 IECC, we’re looking at you.) The Southwest Energy Efficiency Project has studied all versions of the IECC and worked with many communities that have implemented them. 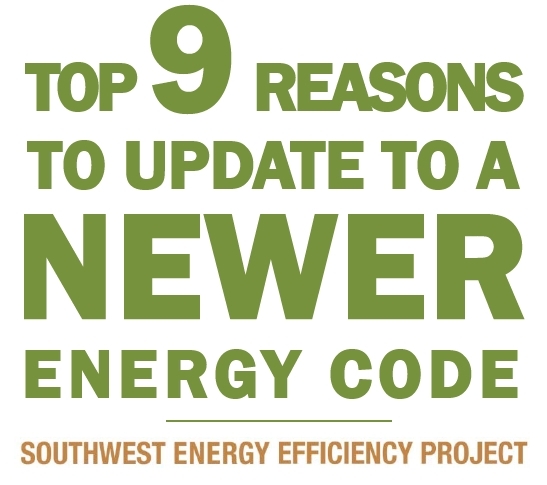 With that in mind, here are our top reasons to update to a newer energy code. It's better written (and that means better compliance). Newer codes have clarified sections of the IECC that had caused confusion, simplified the language, and removed contradictions between different parts of the code. For each new code cycle, the everyday users of the code--builders, code officials, raters, etc.--submit ideas for improvements that make the code better, and those ideas are voted in (or out) by their peers. Training and software availability. Training classes and webinars are typically offered only for the latest energy codes. If you wait several years to move up, you’ll miss the free ones and need to pay for custom training, or muddle your way through it on your own. Software, too, is only supported for the latest energy codes. The U.S. Department of Energy's RESCheck and COMCheck software—which jurisdictions across the country use for compliance verification--are only supported for the latest three energy code versions. (Once this software supports the 2018 IECC, they'll only support the 2018, 2015, and 2012 versions, and will remove the 2009 code from downloadable and online use. In our computer software analogy, it’s like how Microsoft no longer offers support for older versions of Windows. Avoids huge jumps or massive changes by updating regularly. Each newer version of the code has some changes and some improvements. Over time, if you "skip a few rounds," these changes add up considerably and it becomes a daunting challenge to play catch-up. We've seen some jurisdictions on, say, the 2006 IECC now desiring to update to the 2015 IECC and wishing they had just stayed up to date. It's easier to stay caught up than try to catch up later. Consistency for builders from one jurisdiction to the next. Most builders and trades work in multiple jurisdictions at once, and they don't want to spend time changing building practices from one side of the street to the other with a patchwork of different codes and standards. When one jurisdiction already has a newer code in place, we see a "spillover effect" where other neighboring jurisdictions get better buildings as well. And so, if many builders are already meeting a better code, why not update the code officially to pull up the "clunkers?" More flexibility for homebuilders. The 2015 IECC added a new compliance path for residential--the Energy Rating Index, or ERI path. This allows builders to meet the code by reaching a whole-house target score (a numerical 0-100 score), customized by climate zone. One example of this score is RESNET's Home Energy Rating System (HERS) rating, already used to rate a third of all new homes. Jurisdictions on earlier or outdated versions of the energy code are missing this advancement. Newer materials, technologies, and techniques. As newer building materials, technologies, and techniques become more commonplace and cost-effective, they are incorporated into the latest version of the energy code. Updating to the latest energy code ensures your residents and building owners are getting the innovations in efficiency and style seen in neighboring jurisdictions and states. Building codes work together as a package. The energy code is one of many codes adopted and enforced locally. Local officials, through the International Code Council, also develop model plumbing codes, electrical codes, fire codes, mechanical codes, and more, all in tandem. They all fit together like a puzzle. Unfortunately, we’ve seen some jurisdictions upgrade to a newer suite of codes but leave the energy code behind--a mistake that leads to codes out of sync, and inconsistencies between code elements. You can't take a chunk of one jigsaw puzzle, put it in another, and expect it to fit well. It's better to upgrade the whole suite at a time, including the energy code. Sturdier, better-built, and more resilient. Houses and buildings built to newer codes are more efficient and can take advantage of newer materials and techniques. These homes and buildings are better able to withstand severe temperature swings, storms, moisture and mold issues, and more--making them more durable and more comfortable for residents and tenants. Big cost savings for residents and businesses. The savings from energy codes pay for themselves many times over in reduced energy bills. This means money in the pockets of homeowners and building owners. The extra costs upfront in efficient new homes meeting newer energy codes have typically paid for themselves within a year, leading to savings every subsequent year after. For a 30-year fixed mortgage--or a 100-year-life building--these savings add up. Are you comfortable using Windows XP or Vista on your computer, or a six-year-old version of iOS or Android on your cellphone? Probably not--which brings up the question of why some stakeholders are willing to accept this level of construction. The solution--updating to the 2015 IECC without delay and improving efficiency beyond this baseline moving forward.